If you’ve got an eye exam penciled in for some time in the near future, there are a number of things you can do to be extra prepared for it. There are a few things you should tell our eye doctors so that we can guarantee your eyes are examined adeptly and thoroughly. Because your eyes can be affected by seemingly unrelated health conditions, it’s important that you let us know about any recent changes you are aware of. To give an idea, this includes pregnancy, diabetes, high blood pressure, and even something which may seem trivial, like allergies. Eye doctors will also benefit from knowing details of your current lifestyle, such as if you’re a smoker, because this can have a poor effect on your eyes. Tell us what you’re using your eyes for. Does your job take place in a factory, or do you work in an office? Knowing this information will help us to figure out your vision correction needs. And if you have any eye diseases effecting members of your family, it’s important to tell us, because a number of them are hereditary. Having an understanding of which conditions you may be susceptible to will make it much easier for us to keep an eye out for and keep track of any warning signs. Make an appointment if you observe anything strange about your eyes and vision including double vision, blurriness, flashes of light or spots. With the information we have about your history, coupled with our expertise, we’ll get to bottom of the source of the condition, and figure out the most appropriate treatment. It’s also helpful if you take your most recent glasses along to your exam. 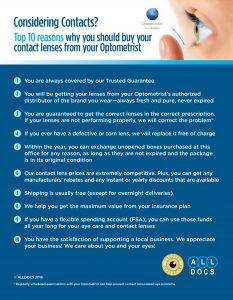 Glasses give us important information, even if you wear contact lenses. So don’t forget all this when you next see us. Together, we’ll figure out the most efficient way to solve whatever issue you may be experiencing!